If you are applying for a graphic design job then make sure that your covering letter is good enough to make a difference for you. Most CVs would get lost in between other hundreds of applications so make an effort and write something good. There are many relevant HND or degree level qualifications that a graphic designer would benefit from so make sure that you include reference to any that you have in graphic design, fine art, film or television, visual art, 3D design, communication design or illustration. Any higher qualifications should also be mentioned as this is a competitive field and you will need to stand out from the crowd. Any relevant work experience should also be mentioned, whether as a graphic designer specifically or in a related job. A graphic designer will also need good communication, presentation, networking and time management skills with an attention to detail and being open to feedback and willing to make appropriate changes. Obviously drawing and technical skills are also required. Demonstrating an ability to do this in the covering letter is important. The layout of the letter is critical because this will demonstrate your design ability and it could even be more important than the actual content. Therefore make sure there are no spelling or grammatical errors and the spacing is correct. Making it unusual with a creative touch is a risky approach so you will need to decide whether to take a gamble or not. 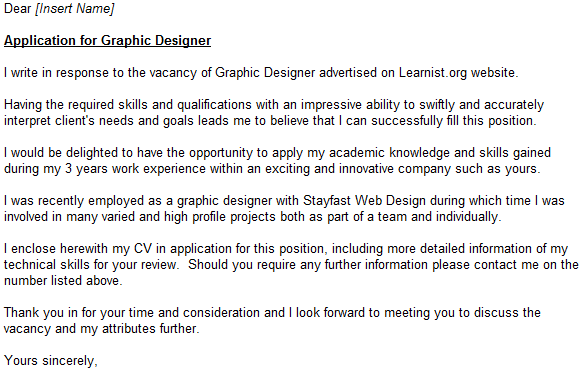 I write in response to the vacancy of Graphic Designer advertised on Learnist.org website. Having the required skills and qualifications with an impressive ability to swiftly and accurately interpret client’s needs and goals leads me to believe that I can successfully fill this position. I would be delighted to have the opportunity to apply my academic knowledge and skills gained during my 3 years work experience within an exciting and innovative company such as yours. I was recently employed as a graphic designer with Stayfast Web Design during which time I was involved in many varied and high profile projects both as part of a team and individually. I enclose herewith my CV in application for this position, including more detailed information of my technical skills for your review. Should you require any further information please contact me on the number listed above. Thank you in for your time and consideration and I look forward to meeting you to discuss the vacancy and my attributes further. I wish to apply for the position of Graphic Designer advertised recently in (enter paper/website) as I believe I have the skills and qualifications that match your requirements for this position. I would welcome the opportunity to apply the skills and knowledge I have gained to your organization and I feel I would prove to be an asset to your productive team. I have been employed at (company name) for over three years as a graphics designer and have been involved in many high profile projects. I work well within a team yet capable of using my own initiative and have an in-depth understanding of emerging technologies in new media. I have excellent communication skills, both verbal and written. I have enclosed my CV for your information. It includes a detailed list of my technical skills. Please fee to contact me on (number) and I look forward to meeting you in the near future. Thank you in advance for considering me for the position of Graphics Designer. I am extremely interested in your Graphics Designer vacancy on the My New Career website. I have more than three years of experience in Graphics Design and Web Development. I am confident that my strong education background in Design and Technology, together with my practical experience as a proven Web Developer, will make me an ideal candidate for the job. I have worked on a wide range of projects in a variety of industry sectors and have always delivered strong, sharp graphics on deadline and within budget. In addition to my design and technical skills, I am also an excellent communicator, listener and team player; all of which are extremely essential attributes required to become a competent Graphics Designer in a busy working environment. I am particularly interested in working for your agency because of its impressive standing in the design industry. Many of the projects that your company has undertaken demonstrate the agency’s commitment to innovation and progression of technology; something that I really want to be a part of and contribute towards. Please find attached my CV and I would welcome the opportunity of an interview. If you have any further questions please contact me at your convenience. Yes, most CVs get lost in the hundreds and thousands of them that companies receive. A lot of employers find it very tiresome to flick through CVs and letters for hours, so it’s definitely worth putting in some effort to make yours stand out. Things such as good grammar, proper headings, the right length and the right content will all make yours more obvious and easy to read.